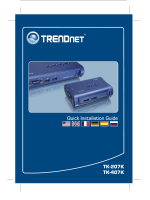 Note: The TK-200/TK-400 do not require any drivers or software. each computer to the KVM switch. Note: Do not press the push button of the KVM switch or perform a "Hot-Key"
command while the computers are booting up. Go to Section 3 Operation. Press the push button to switch between computers. After pressing the ScrLk key, you have 2 seconds to press the ScrLk key again. a key within 2 seconds, the switch will exit hot-key mode. select the previous port, and “S” key to set the KVM switch to Auto-Scan mode. Q1: Where is the AC adapter? I did not find one in the box. 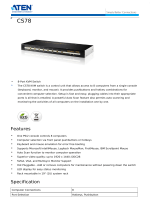 your KVM switch will function. your computers, and try to use the KVM switch again. Q3: Can I connect or disconnect the KVM cables while the computers are turned on? turned on, because the interface is Hot-Pluggable. 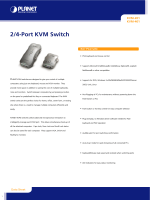 Q5: How do I switch from one computer to another with the KVM switch? Hot-Key commands. Go to Section 3 Operation for more information. 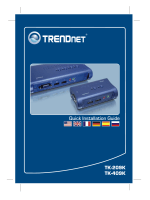 please contact Trendnet's Technical Support Department. 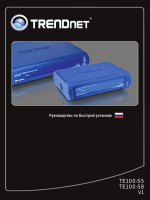 This equipment has been tested and found to comply with FCC and CE Rules. time from the date of purchase. or attempt to service the product by any unauthorized service center. conditions more severe than those specified in the manual. number, accompanied by a copy of the dated proof of the purchase. prepaid, insured and packaged appropriately for safe shipment. FIRE, LIGHTNING, OR OTHER HAZARD. HEREIN SHALL FAIL OF ITS ESSENTIAL PURPOSE. Copyright ©2006. All Rights Reserved. 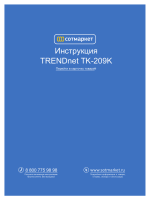 TRENDnet.